Orkney is closer than you think, with great transport links to the rest of the UK and beyond. Whether you choose the quick option of flying to the islands, or a more leisurely road trip and ferry journey, there’s plenty of choice when it comes to tailoring your Orkney adventure. Our air links also mean doing business in the islands is straightforward and time effective. You can fly to Orkney with Loganair. 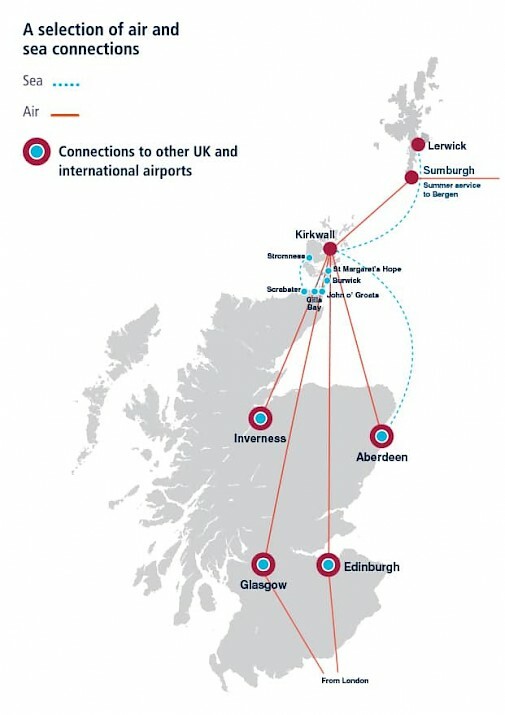 Flights are available from Glasgow (60 minutes), Edinburgh (60 minutes), Inverness (45 minutes), Aberdeen (50 minutes) and Shetland (35 minutes); most also have good links to other national airports. If you wish to drive, head north to the ferry ports of either Aberdeen, Scrabster, Gills Bay, or John O'Groats (passenger ferry only May-September). There are three main vehicle ferry routes to and from Orkney. NorthLink Ferries sail between Lerwick in Shetland, Hatston in Kirkwall and Aberdeen, with the company also operating the 90 minute service between Scrabster and Stromness. A quicker option again is the Pentland Ferries catamaran, which sails between Gill’s Bay, near John o’ Groats, and St Margaret’s Hope in South Ronaldsay (just over 1 hour). If you have your own boat, there are three marinas in Orkney which you can sail to: Kirkwall, Stromness and Westray. Find out more on the Orkney Marinas website. Citylink buses run to Aberdeen, Thurso and Gills Bay, with ongoing ferry connections to Orkney. The Orkney Bus, which travels direct from Inverness to Kirkwall and utilises the John O' Groats passenger ferry link, runs between June and the start of September. Travel by train to Aberdeen or Thurso, where you can catch a ferry to Orkney from the harbours listed above. More information on train timetables can be found on the ScotRail, National Rail and Trainline websites.